To emphasize the value in personal communication with people your brand works with, I talked to Tiffany Merritt author of blog Stuff Parents Need. Tiffany is one of the bloggers who attended the event that Unclaimed Baggage hosted. Tiffany immediately wanted to work with Unclaimed Baggage because their outreach email was personal and the invitation outlined all the specific details of the event. 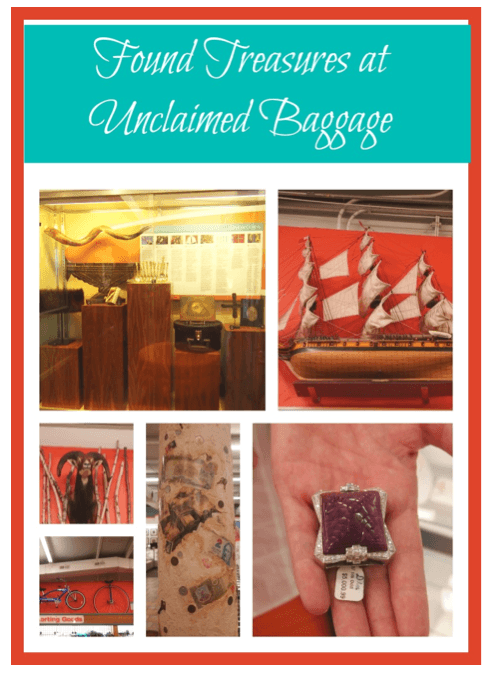 She thought that Unclaimed Baggage had a unique story to share with her readers and it would pique their curiosity. In this case, it was an awesome fit for both Tiffany and Unclaimed Baggage. Cheers to mutually beneficial relationships! Between the gift card she received to shop at Unclaimed Baggage and the behind the scenes look at the store and the cool story of the brand, Tiffany felt she had plenty of good content to share with her audience. Here is her post if you want to check it out. When you work with influencers for your brand, try to put most of your focus on giving them an awesome experience and something to talk about. If you don’t place restrictions on posts and deadlines it gives the bloggers time to weave your brand organically in to their content. This is the best coverage your brand can get because the mention comes across as authentic. In the instance of Tiffany’s post about Unclaimed Baggage, she was not given any deadlines so she took it upon herself to write about the brand, the day she spent there, and suggested it as a great place for families. “They gave us the latitude to communicate with our audiences in the way that we knew would serve them best,” Tiffany said of her experience. While I’m not a fan of giving influencers deadlines on posting if they choose to take you up on an offer, I am a fan of providing them with specific content and assets to steer them in the right direction without coming across as controlling. Tiffany said that it was because of Pinterest that her post for Unclaimed Baggage did so well. This emphasizes how important it is to equip your bloggers with strong visual assets, such as high resolution photos and logos. Keep in continual contact with everyone in your brand’s sphere for an ongoing delivery of organic mentions about your brand. The brand that always comes to mind when discussing ongoing relationships with influencers is Char-Broil. They do a great job of dripping their network infographics, asking for and implementing their feedback about the brand, sending free new products, sending brand swag, and keeping them informed on all things Char-Broil. This type of constant interaction makes the people in a brand’s network feel like a part of the brand instead of an outside extension. When an influencer’s own audience sees continual brand mentions, they trust that the influencer actually stands behind the brand. Read Char-Broil’s case study here if you want to learn more. Having a strategy in place to track your relationships not only lets you know which ones are the most beneficial for your brand, but you can also analyze in real-time when an influencer, ambassador, or an advocate talks about you. This is a huge component of a good outreach marketing strategy because being able to socially share your brand mentions, thank the people who talked about you and reward them is what brings you to a mutually beneficial relationship—the type of relationship you set out to create when you started this whole marketing thing. If you want to know more about outreach marketing strategies, check out this archive of awesome presentations on the topic. Do you have a case study about a strategy you or someone you know has implemented worth sharing? Share in the comments below or reach out to me. I’m always looking for inspiration for these influencer case studies!